Mighty fancy tea chest. I bet it is a pleasure to use. Nice work. The way you used that maple is super nice. It really works well with the walnut. It is because of projects like this that I can’t show my wife this site! Her wish list would never end! Just beautiful! She must be happy! This tea chest is a real beauty and so nicely done. Wow! That is just gorgeous she should just love. Well done and welcome to LJ! Very nice. I especially like the inlay. I’m going to show my youngest daughter this. Her tea collection has taken over an entire cabinet in the kitchen and my wife would like it back. If I build my daughter a tea chest I would get points from both of them….. and I might be able to find some woodworking item I would need to complete the project. That would be a win-win-win…..
Did you find plans on-line of draw something up yourself? Very nice. I especially like the inlay. I m going to show my youngest daughter this. Her tea collection has taken over an entire cabinet in the kitchen and my wife would like it back. If I build my daughter a tea chest I would get points from both of them….. and I might be able to find some woodworking item I would need to complete the project. That would be a win-win-win….. I didn’t find anything on line, but I have seen that pattern of inlay on an old Indian blanket. It looks like it may be difficult to lay out without a lot of measuring but It’s really very simple one you know the secret. I didn t find anything on line, but I have seen that pattern of inlay on an old Indian blanket. It looks like it may be difficult to lay out without a lot of measuring but It s really very simple one you know the secret. As to the tea chest, well it’s beautiful! 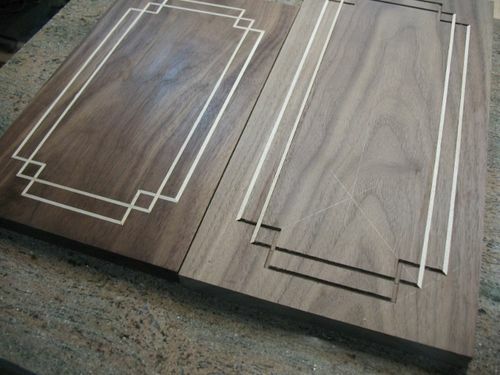 The inlay looks great and is very well done—and the walnut is amazing as it always is! As to the tea chest, well it s beautiful! The inlay looks great and is very well done—and the walnut is amazing as it always is! It’s hard to explain, but I’ll try my best. The first thing to do is draw a 45-degree line in from each corner. Make sure your line is exactly from each corner with a combination square to a point where the lines intersect. Set you router to the depth you want and to the distance from each edge. Now route your first rectangle, which will be the one farthest from the edge. Route to the lines drawn, stopping at each line. Once those corners are squared with a chisel you will have a rectangle at an exact equal distance from each edge. Now once again with your combination square draw another 45-degree angle across each corner. The line must just barely touch the corner of the first routed rectangle. 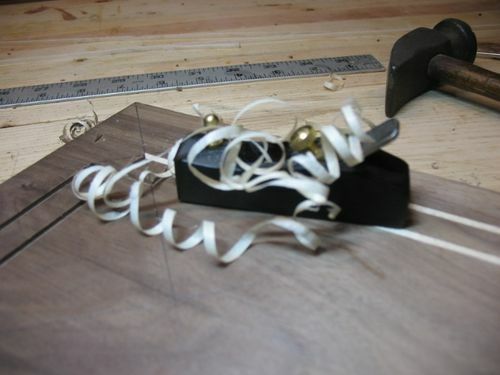 Now set your router to the distance from the edge you want for your outermost inlay. Now route your second rectangle stopping at the line you’ve drawn across each corner. 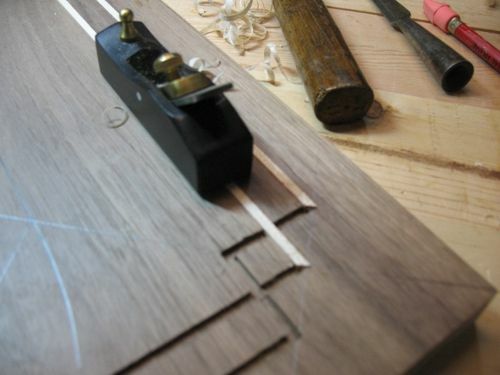 The inlay process will be much easier if you inlay the first rectangle then route through it to cut the second rectangle. This is difficult to explain when you have to put it in writing, hopefully you can see the lines I’ve drawn on the walnut panel on the right in this photograph. Count on screwing up the first one you make, so practice first. may make it easier to understand. Then my poor explination. Love the design and very well executed. Bravo!